All transactions are safe and secure with a reliable history in online purchasing behind each of our associates. Buy the Nerdy Hello Kitty t-shirts to own Hello Kitty clothing and merchandise. 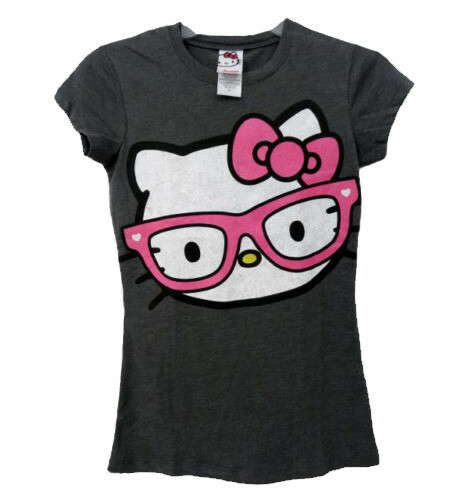 This precious grey, white and pink Hello Kitty tee shirt features Kitty White looking studious in her thick pink spectacles and pink bow. Perhaps she has a study date with her knight in shining armor, Dear Daniel. While most fans will enjoy all of our white, black, and pink Hello Kitty t-shirts, this simple nerdy design offers its own unique humor. Add Hello Kitty plush dolls and stuffed animals to keep you company. In addition to the Nerdy Hello Kitty tees above, browse the Hello Kitty Clothing Gallery for more apparel like men's and women's clothes, kids shirts or hoodies.